Alterative (mildly alters a condition), blood purifier, respiratory tonic. As I go for my daily walk in the woods, the most common plant I see is these days is Wild Red Clover. The flowers are peeking their heads out of the tall grass while sister white clover is low among the plantains and dandelions. A member of the legume family, it is a favorite herb among herbalists. I pick a few to bring home for a lovely cup of tea. Red Clover is known as an excellent blood purifier, lymphatic cleanser, and an ally for women’s reproductive health. The blood building, detoxifying and cleansing actions assist the body in the removal of toxins has the benefit of imbuing a beautiful glow to the skin. I have seen remarkable results in forty-something-year-old women experiencing mild acne. Most are, first, astounded that they are “feeling like a teenager with zits” and secondly astounded by the results this herb can achieve. The cleansing action of this plant may also reduce inflammation in arthritic joints. 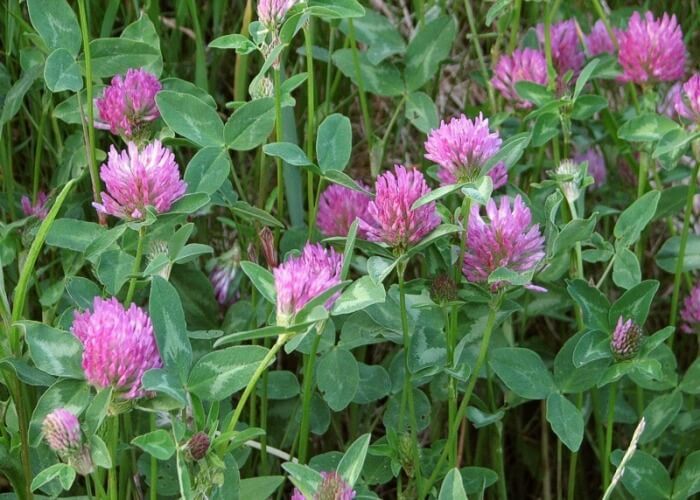 Red Clover is, also, loaded with minerals, specifically calcium, nitrogen and iron and therefore a benefit to anyone worrying about mineral balance. Another “must have” herb for women as we pass into our 30’s and beyond for these minerals and for the lymphatic alterative action that has been shown to be beneficial in reducing cysts and fibroids. The flowering tops are the part used to brew a cup of tea. If you can get to a “patch” that you know has not been sprayed with pesticides and is away from car traffic, it is most rewarding to gather a good bunch of flowers, rinse well, place them in a teapot, cover with very hot but not boiling water, let steep for 5 minutes and enjoy. Adding a pinch of Stevia herb will imbue a lovely sweet taste. I’m not a fan of the powdered or liquid Stevia; use the dried plant, which you can find in bulk in any natural food store. Red Clover is also used, today, as one of the major anti-cancer herbs we have available. Used as a tincture, tea, or paste, many herbalists speak of remarkable results using this herb in treating even the most difficult cancers. I would dare say, that all of us have all had a family member or friend afflicted with one type of cancer or another. Contact a trusted alternative health professional if you need assistance in this area. My information is never to steer someone away from their trusted physicians….only offer an alternative when seeking an alternative to prescription drugs.